I finally found a place here that sells NYX! So if you're in the Toronto area, hit up Vaughan Mills and go to DCW. Before that, I ordered them online from Nonpareil. Anyway, I love these! I purchased Black Bean, Yogourt, Pots and Pans, and Lavender. I already owned Milk and Gold. I don't know a soul who has bought Milk and not liked it. I think it's a great one to start with. 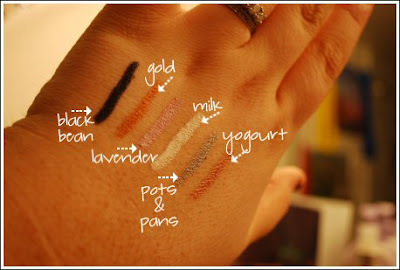 Many use these as a primer for their shadows, but I still add a primer first. That is because if you add too much color, they will crease in time. With the primer, they absolutely stay put. 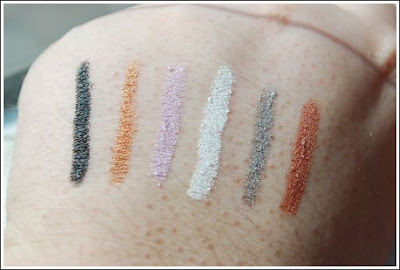 The swatches below are also only one swipe of the color! 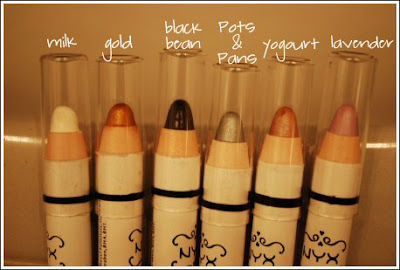 They are very pigmented and can last you a long time before having to buy another!